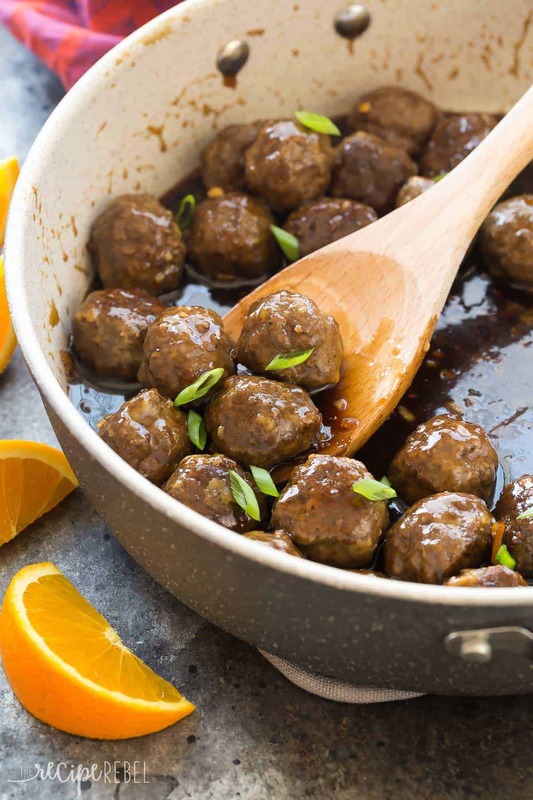 These Easy Meatballs in Orange Sauce have just a few ingredients and are perfect for a quick dinner, freezer meal, or even a holiday dinner or appetizer! Perfect over rice or with mashed potatoes. Includes step by step recipe video. You guys: Meatballs in Orange Sauce are changing the dinner game. There are so many foods that I just love. That are borderline an obsession. Meatballs are just one. Surprisingly though, I don’t have that many meatball recipes on The Recipe Rebel. I have these Pineapple Brown Sugar Meatballs (<– amazing), aaaaaand….. yep. That’s about it. I think one of the reasons why is I have been focusing a lot on super easy, little prep, often one pot/pan/dish dinner recipes for those “what on Earth am I going to make for dinner?! ?” moments we all have. Some of us more regularly than others. And meatballs, well — they are easy, yes, but they take a little time if you’re making them from scratch. Usually, if I am making meatballs I am really making meatballs and I will make 6 or 8 pounds at a time to freeze, fully cooked and ready to dump into whatever sauce I have bubbling on the stove that night (no judging if that happens to be a store-bought jar of marinara). Obviously, you can skip the whole homemade meatball step if you’re in a time crunch and need something quick. Just read the packages of whatever you’re buying, make sure that you know what the ingredients are and stick to an ingredient list as basic as possible. The sauce is still going to totally take these over the top! 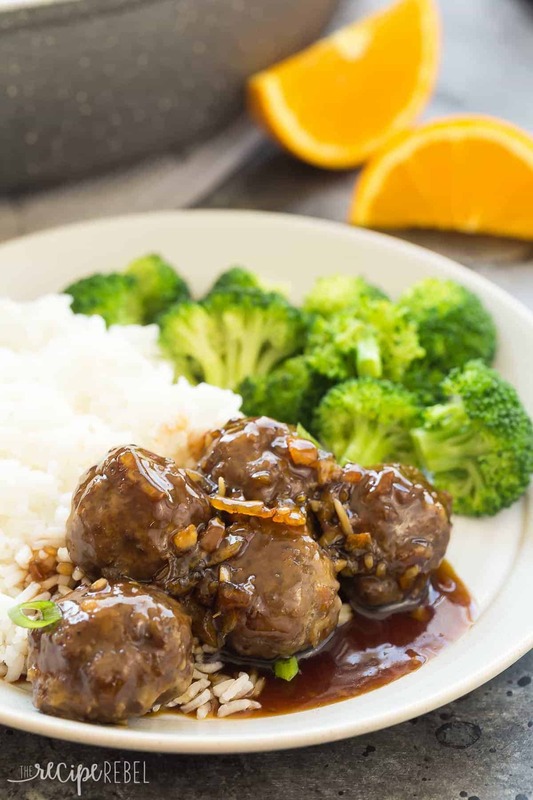 Before you get to the recipe, I feel like I need to confess: I’ve tried many, many orange sauce, orange chicken recipes that I absolutely hated. But I struck gold when I realized that it was the orange juice that wasn’t doing it for me — when I tried with orange marmalade, I really, really enjoyed it! So if you’re wondering why the marmalade and not just fresh juice and zest, that is why. As I mentioned, yep, just above — you can use store bought meatballs for this recipe. Just make sure you pick something that is good quality that you want to serve to your family. Meatball recipes are great in the slow cooker, too, you just have to be careful because if you cook them all day they’ll be falling apart. 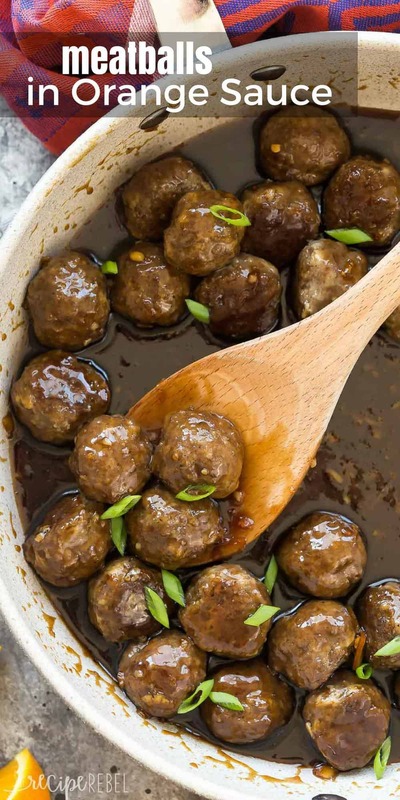 If you want to make them in the slow cooker, I would prefer the meatballs and the sauce first, then combine them in the slow cooker and set to low for 3-5 hours max. Perfect for a family gathering or party! Try serving with rice, noodles, or mashed potatoes and a green veggie for the full meal deal. These freeze perfectly with or without sauce, making them the perfect meal to save for busy nights or to give to a family with a new baby! You can even cook the rice, freeze in a separate bag and give them together! Make the meatballsPreheat the oven to 350 degrees F.
In a large bowl, combine beef, egg, bread crumbs, Worcestershire, salt, pepper and garlic powder just until combined. Shape into 1" balls (or 24 equal portions) and place on a baking sheet (you can line with parchment for easy clean up). Bake for 20-25 minutes until browned and internal temperature reaches 160 degrees F. Set aside. Make the Orange SauceIn a large skillet, coming the marmalade, soy sauce, vinegar, garlic, ginger and red pepper flakes with a whisk. Stir together broth and corn starch and add to the skillet. Stir well. Bring to a simmer over medium-high heat and cook until thickened, about 5-8 minutes. Add meatballs, heat through (not necessary if they just came out of the oven), and serve immediately. You can throw the meatballs plain or with sauce into a freezer bag once cooled and freeze for another use. What if you are out of fresh garlic and ginger will the powder stuff work? I don’t want to use the marmalade in particular. how about just using real orange juice? If it does need some sweetener, I think a little honey would do it. Sure, feel free to try it. You had me at store bought meatballs. I have ZERO meatball recipes on my blog, and I didn’t even realize it until reading this post. I love meatballs too…. Orange sauce has never been my favorite, but maybe I’ll have to try this orange marmalade too. Might change my whole outlook! I also like a little spice, so I may just add a touch of chili garlic sauce to the orange sauce. Do you double the recipe if using a lb or 2 more? There’s quite a bit of sauce in the recipe. If you’re serving as an appetizer and don’t need the extra sauce for serving, you can likely double the meatballs and it will be perfect. If you are serving over rice and want the extra sauce for serving, you will want to increase the sauce as well. These meatballs look INSANELY flavorful, Ashley! I just love the sound of that orange sauce covering every inch of these beauties! My boyfriend would go insane for these.—can’t wait to try! Thanks Sarah! We are all meatball lovers here!